Last Sunday, Hubby and I ran the local Veteran’s Day 10k. That was our first real taste of cold weather in DC, and it was punctuated with frost on the ground when we arrived at the race’s starting line at 8am. I was in my element…I love running in cold weather. In fact, I ended up running my personal best, shaving a little more than 2 minutes of my previous best 10k time. After the race, Hubby and I were able to take it easy for most of the day. I got together with my knitting group got together for a couple of hours in the later afternoon, but otherwise, I spent the day at home recovering and baking the last of the fall, pumpkin cookies. 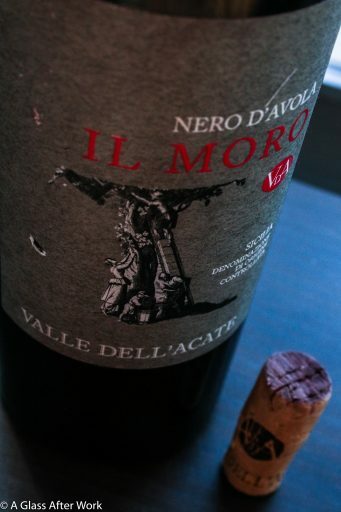 To go with my afternoon baking, I opened a 2013 Valle Dell’Acate Il Moro Nero d’Avola (winery), which is a red wine made from 100% Nero D’Avola grapes in Sicily, Italy. The wine was a deep ruby red with a watery rim. On the nose, there were blackberries and licorice mixed with hints of cedar and cloves. In the mouth, there were tart blackberries and licorice, as well as hints of blueberries and cedar. The wine had a medium body, medium tannins, and high acidity. Is this worth a glass after work? Definitely! If you see this wine in the store, grab it; you won’t be disappointed. At an SRP of $17, this wine is meant to enjoy with food. Admittedly, on it’s own, it was a little sharp for me, but it was the perfect pizza wine to go with the homemade white pizza Hubby and I made for dinner. I also made sure to save a glass to taste with the dinner Hubby made on Monday night–turkey-stuffed acorn squash–and the pairing was absolutely outstanding. With Thanksgiving right around the corner, if you’re looking for a wine that is under $20 and will pair nicely with Turkey Day foods, this is a good option…just make sure it’s the wine you’re serving with dinner and not the wine you open when you’re standing around talking with family. As for the Pumpkin Cinnamon Chip Cookies, they were like biting into a piece of fall. 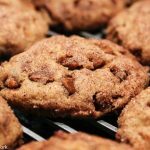 The cinnamon chips intensified the baking spice flavors without overwhelming the pumpkin, making for a tasty fall treat. The cookies were a little crisp on the ends and moist in the center, which was a nice consistency with these flavors. Overall, the wine and the cookies were a nice match. 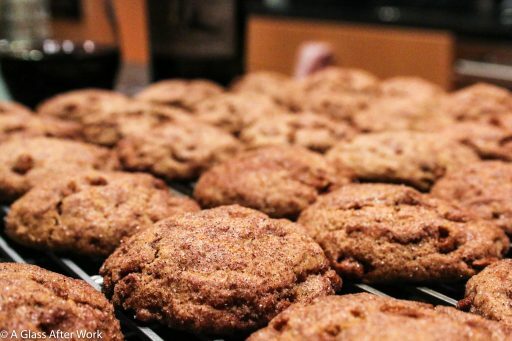 The acidity from the wine made the spices in the cookies taste fresh, and the cookies added a nice depth of flavor to the wine. They felt like a nice indulgence after the morning’s run. What are your dessert plans for Thanksgiving Dinner? Will there be cookies on the table? And do you have a wine picked out specially for dessert? In medium bowl, mix together flour, baking soda, baking powder, cinnamon, nutmeg, ginger, cloves, and salt. Set aside. In mixer fitted with paddle attachment, combine butter and sugar until pale and fluffy. Add pumpkin, eggs, and vanilla, and mix until combined. On low speed, add dry ingredients and mix until just blended (about 30 seconds). Stir in chips until evenly distributed. Divide dough in half and wrap each piece in plastic wrap. Refrigerate for at least 30 minutes and up to 24 hours. Line cookie sheets with parchment or silicone mats and place in refrigerator to chill. In small bowl, mix together sugar and cinnamon for coating. Remove one of the dough halves to begin shaping cookies. Take a rounded tablespoon of chilled dough and roll between the palms of your hands to create 1-inch balls. Roll balls in the cinnamon and sugar mixture until coated. Place cookies on lined, chilled cookie sheets. Keep cookies about 2 inches apart and press them down so that each is about 1/2 inch high. Let cookies set on baking sheet for 2-3 minutes before removing to a cooling rack.